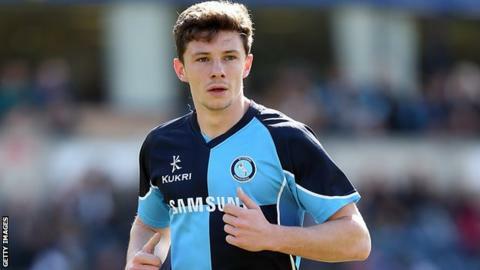 Two goals from Matt McClure helped League Two leaders Wycombe beat 10-man Southend. Matt McClure scored twice as Wycombe beat 10-man Southend to stay top of the League Two table. Jack Payne put Southend ahead inside two minutes, but Paris Cowan-Hall levelled before McClure tapped in Sam Wood's pass to put the Chairboys ahead. Southend were reduced to 10 men when Jerome Binnom-Williams was sent off for a tackle on Josh Scowen. Joe Jacobson's superb free-kick added to the lead before McClure rounded off a comfortable win from 20 yards. The victory put Wycombe two points clear at the top, with Southend, who had won their four previous games, dropping to eighth. "It's possibly the result of the season so far. It's a really strong Southend team that came here today. I thought we were outstanding today. "We've got some big games coming up over the Christmas period. Get down here and get behind your boys. Be proud of your boys. I'm extremely proud of everybody involved with Wycombe today. "We've got to stay consistent, we've got to stay grounded. We've got to keep working so hard and keep things going. I'm so pleased because we worked really hard in training and it paid dividends." Match ends, Wycombe Wanderers 4, Southend United 1. Second Half ends, Wycombe Wanderers 4, Southend United 1. Alfie Mawson (Wycombe Wanderers) is shown the yellow card. Substitution, Wycombe Wanderers. Daniel Rowe replaces Sam Wood. Corner, Wycombe Wanderers. Conceded by Luke Prosser. Attempt missed. Fred Onyedinma (Wycombe Wanderers) right footed shot from outside the box misses to the right. Attempt missed. Fred Onyedinma (Wycombe Wanderers) left footed shot from the left side of the box is close, but misses to the left. Corner, Southend United. Conceded by Joe Jacobson. Goal! Wycombe Wanderers 4, Southend United 1. Matt McClure (Wycombe Wanderers) left footed shot from outside the box to the top left corner. Attempt missed. Paris Cowan-Hall (Wycombe Wanderers) right footed shot from outside the box is close, but misses to the right. Attempt missed. Cian Bolger (Southend United) left footed shot from the centre of the box is too high. Substitution, Southend United. John White replaces Michael Timlin. Goal! Wycombe Wanderers 3, Southend United 1. Joe Jacobson (Wycombe Wanderers) from a free kick with a left footed shot to the top left corner. Hand ball by Ryan Leonard (Southend United). Attempt saved. Matt McClure (Wycombe Wanderers) left footed shot from the centre of the box is saved in the bottom left corner. Gary Deegan (Southend United) wins a free kick in the attacking half. Paris Cowan-Hall (Wycombe Wanderers) wins a free kick in the attacking half. Jerome Williams (Southend United) is shown the red card.